Cartoon-based toylines these days don't seem to have the same "legs" that they used to. Judging by the amount of time every day they spend airing it, Johnny Test is the most profitable thing Cartoon Network has ever held the rights to, and yet the only toys it's ever had were Happy Meal premiums. Compare that to The Real Ghostbusters, which began airing in 1986, stopped in 1991, and had toys the entire time. The show featured four guys who never changed their clothes, but Kenner managed to milk that for years. 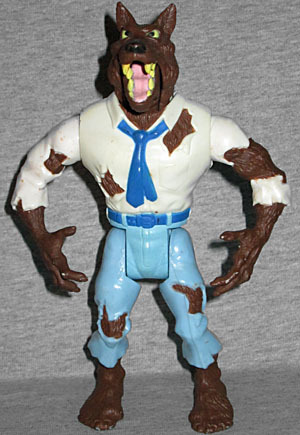 It wasn't just silly variations of the team, either: Kenner did lots of ghosts (most of which never appeared on the show), and in 1989 released a six-figure "Monsters" subline based on all the classic beasties: Dracula, Frankenstein, Quasimodo, Zombie, Mummy, and of course, a Wolfman. Werewolves (and vampires) did actually appear in an episode of The Real Ghostbusters - Season 2's "No One Comes to Lupusville." It was written by J. Michael Strazynski, and is one of the few episodes I can actually remember seeing - thanks to its fairly memorable ending. Of course, this Wolfman doesn't look at all like the ones seen in the episode, but that hardly matters, does it? Wolfie's head is of the "very canine" variety. This isn't just Wolverine hair, an underbite and a black nose, it's a full-on dog head sitting on a human's shoulders. Thanks to the specific design choices, he looks kind of cross-eyed, but if it was done any other way, his eyes would have been pointing two different directions anyway. And nobody wants a walleyed werewolf - not even an obsessive like me. 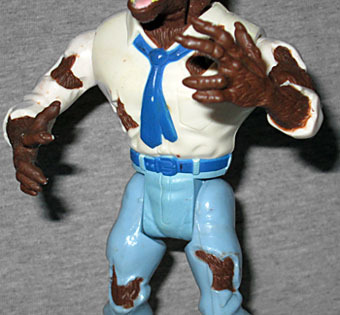 The werewolf is wearing the torn remnants of his human clothing: a dress shirt with a blue tie (and matching belt? ), plus light blue pants. There are no shoes, although his feet are still vaguely humanoid - he's not like the NBX Wolfman, with those cute little paws, he's basically got hairy human feet (like my college roommate's boyfriend Ezra, or a Hobbit [but those might have been the same thing]). There are rips by his knees, on his chest, and on the sleeves of his shirt that allow his sculpted fur to show through, but nothing at all on his back. He doesn't even get a tail poking through or anything! The figure moves at the shoulders and hips - all of them swivel joints. He might have had more articulation, if not for his action feature, but when the action feature is this cool, it's a trade-off worth making: when you squeeze his legs together, he throws his head back, closes his mouth, and spread his arms wide; he's holwing at the moon! It's a really fun little gimmick, and still works perfectly even 24 years after its release. It's a shame that companies can't just crank out the toys the way they used to. Mattel's Justice League Unlimited line may have far out-lasted the cartoon that inspired it, but that's because it had tons and tons of characters, and was being sold directly to us nerds. 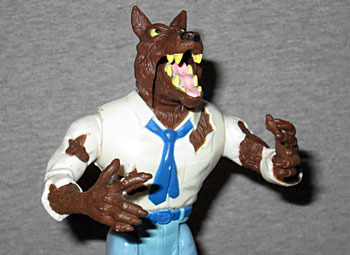 The '80s really were a golden age of toys, because something like this werewolf couldn't be made today.